Growing up, my family vacationed most summers in a beach town just up the coast from us. There, seemingly every street corner was punctuated with a store selling souvenirs, American flag beach towels, personalized bottle opener key chains and hermit crabs. One summer, I actually managed to convince my mom to let me bring one of these shelled pets home with me. I named him Big Pete, because he was by far the biggest hermit crab any of us had ever seen. He had a large, white shell with broad spirals on it. For months, my siblings and I took great care to feed him, soak the sponge in his tank, fill his water bowl and even let him scuttle about the dining room tabletop, much to my mom’s disapproval. Then a hurricane rolled through our town in September of that year, and our house was hit hard — a massive pine tree that had once stood guarding our home was uprooted and fell on the back side of the house. Sadly, it was the side of the house Big Pete’s enclosure was on, and in the chaos, his tank hit the floor and broke open. The next morning, as we began sifting through the debris, we made the discovery. Naturally I was heartbroken. Big Pete was one of the first pets we’d had in my household that was solely my responsibility. But life goes on, as it were, and by the time our house was put back together, I was feeling pretty patched up too. Over the years, we would tell stories of Big Pete every time we saw a hermit crab. We never got another because, well, no one ever seemed to measure up to Big Pete (quite literally). Fast-forward to around four years later, when my mom was getting a new washer and dryer. When she scooted the old machines out of their longtime resting places, she spotted something. There, fiddling about in the dryer lint and fuzz that had accumulated over the years, was Big Pete. Alive. I kid you not. 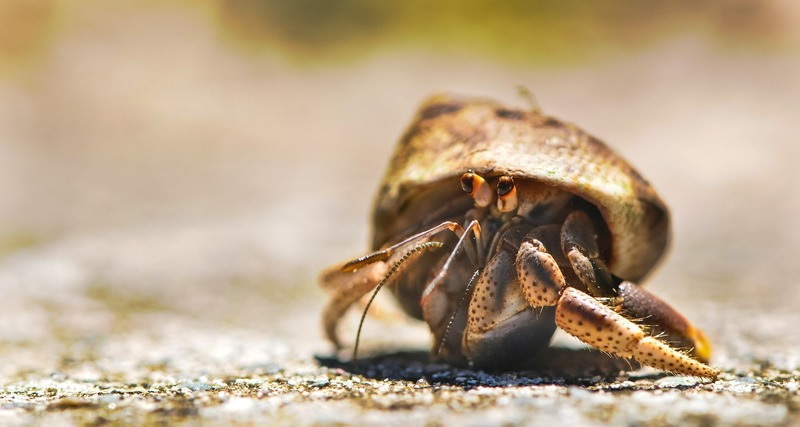 Recently, when the subject of hermit crabs came up and I began recounting the now legendary story of Big Pete’s insane survival skills to a friend, it got me wondering: What other weird things can hermit crabs do? To be honest, I didn’t know much about the species. So I did a little digging, and here are some of the pretty amazing things I found out about our little shelled friends. While we were amazed Big Pete had managed to survive for so many years on his own, apparently he could potentially have kept on truckin’ (as long as the food and water sources he’d managed to find held out). The normal life expectancy of a hermit crab in captivity is five to 15 years, but there are tales of hermit crabs living as long as 40 years in captivity!